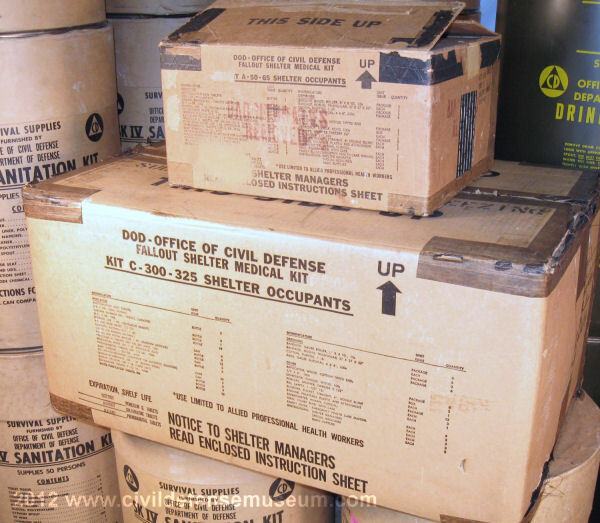 Community Fallout Shelters were stocked with 2 different types of Medical Supply Kits. The Medical Kit-A was to supply 50-65 persons and the Medical Kit-C to supply 300-325 persons. This page contains descriptions and a contents list of each type of kit. 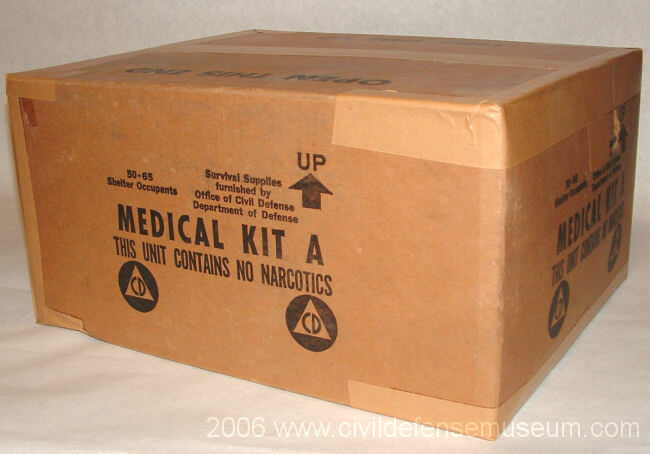 The Medical Kit A in the above photo had never been opened when I found it so it's a good example to show here. 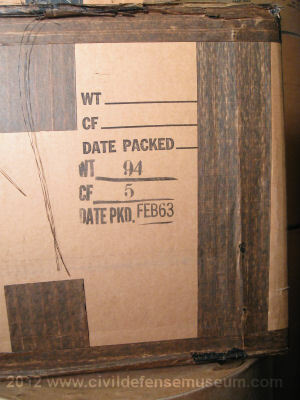 The tape was split, dried and flaking off but the box had never been opened. It was kind of like opening a time capsule when I first flipped up the box flaps. The first two thumbnail photos below were taken as I opened the box for the first time. After going through the kit I repackaged it as it was and resealed it with new paper-type tape similar to what it was originally sealed with. Click photos to see larger. Here are the Medical Kit A contents. The can of alcohol actually has about half of the alcohol still in it. This is the only kit I have ever seen with alcohol still in the can. The alcohol evaporates out of the cans over the years. The list of contents of each type of kit is at the bottom of this page if you want to read a detailed inventory. The big box at the left rear of the picture is the purified cotton and the the white package at the right rear is the package of gauze pads. The smaller white envelope package near the gauze is the pack of cotton tipped swabs (q-tips). Etc. Click photo to see larger. The quality of the photo scan isn't good enough to make out the labels on the packages so the contents can't be exactly matched to the med kit A contents list but there are three thermometers in the photo. The later med kit A only has one thermometer. 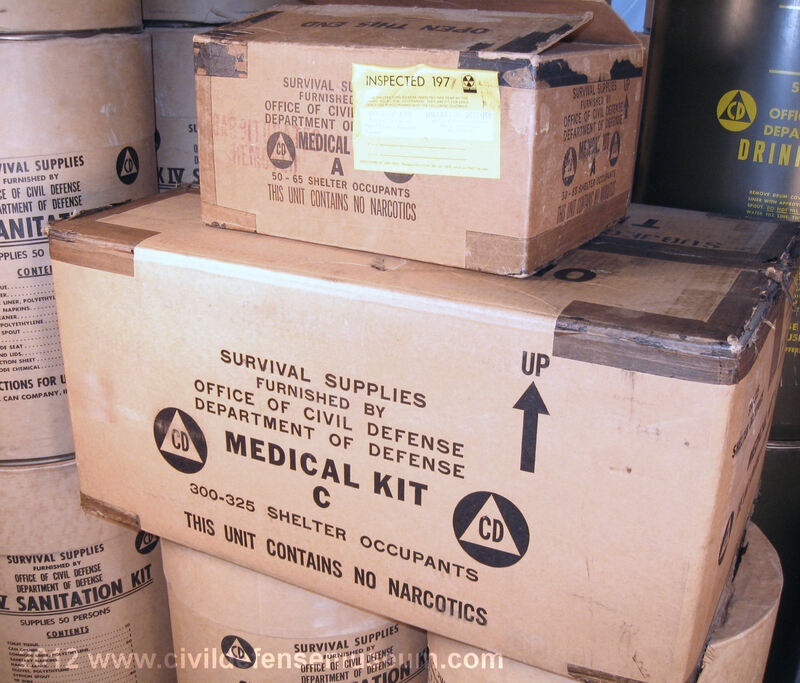 In the early shelter supply make-up list the med kit A is listed as having three thermometers. 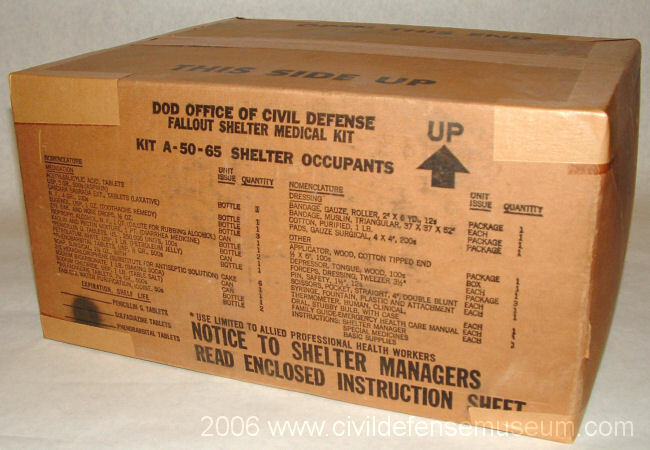 These three early version (water drum, sanitation kit, med kit A) kit photos all seem to match the early shelter supply list I have linked above. 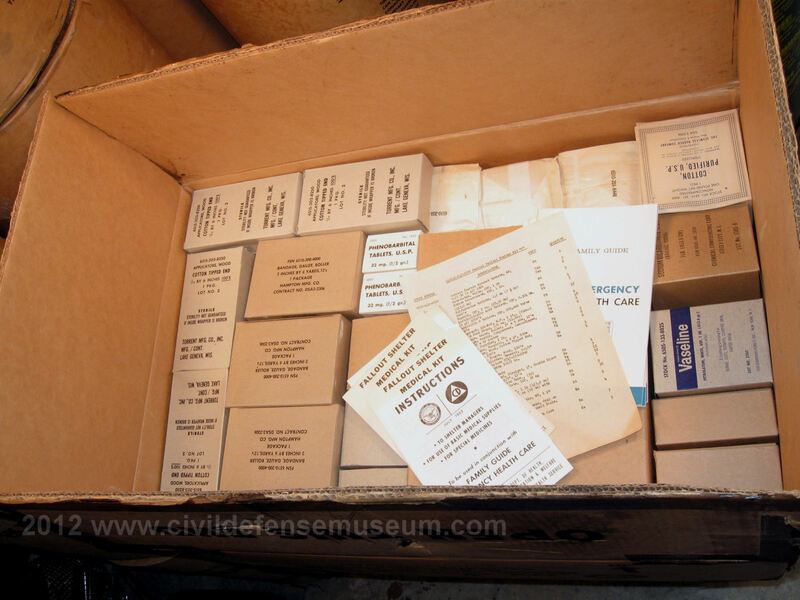 The Medical Kit C is essentially 6 Medical Kit As in one box and was designated to supply "300-325 Shelter Occupants." 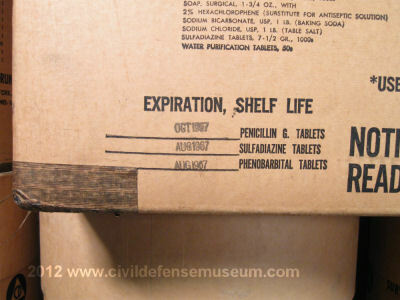 This particular kit is interesting because the expiration dates for the medicines are still legible on the side of the box. All the Medical Kit A boxes I have seen have had the expiration dates marked over. 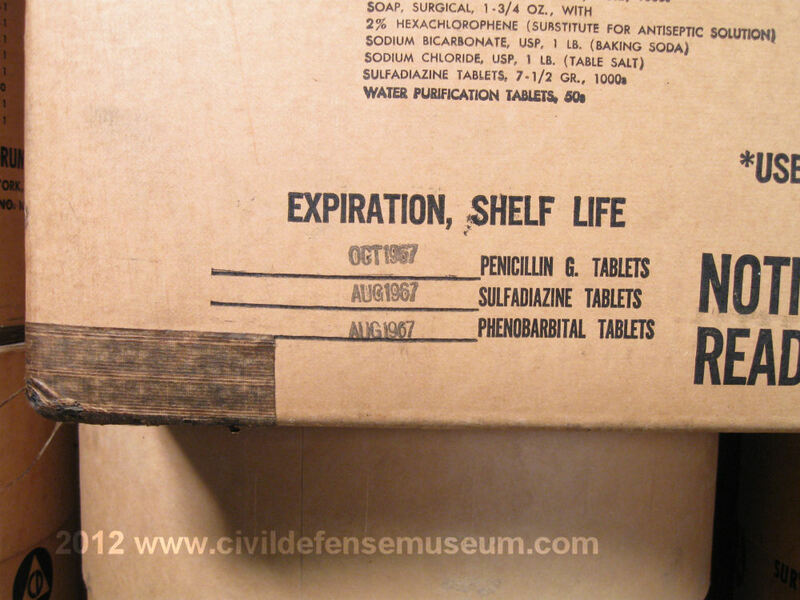 I found a CD Program Guidance bulletin dated March 25, 1966 stating that the expiration dates are "misleading" and that "these dates should be disregarded and, if desired, may be obliterated" hence the marked over dates on the Med Kit A boxes I have seen. To see a PDF file of that bulletin click here. Civil Defense Program Guidance Bulletin for Civil Defense Medical Kits. 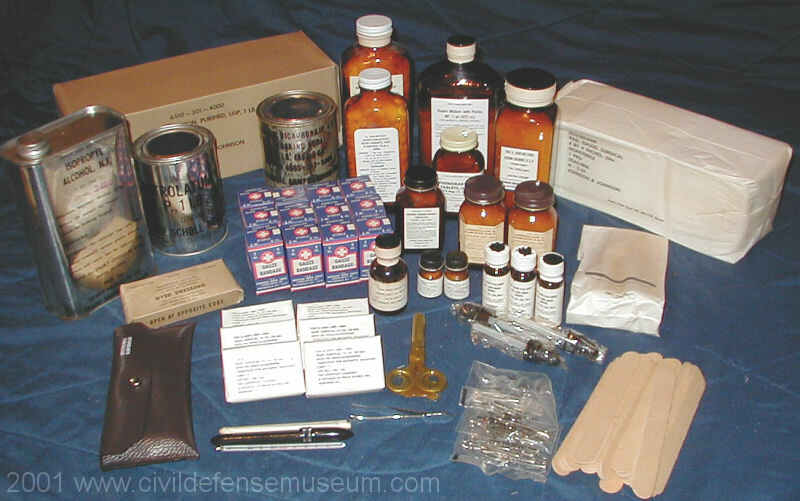 All of the same items found in the Medical Kit A but larger quantities. See kit contents list below. (1) Kit A supplies 50-65 persons. 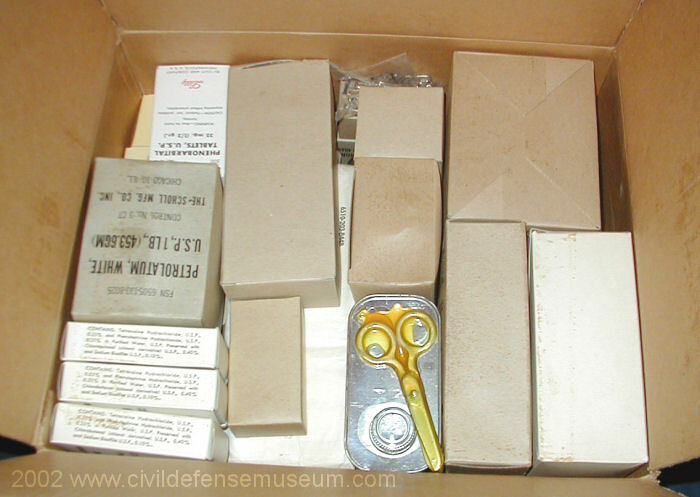 (2) Kit C supplies 300-325 persons. Was there a Medical Kit B? I have a copy of a document that was sent to me several years ago by another CD collector. I can't remember now where he said that he found it but it's particularly interesting in that it appears to be a very early description of the supplies to be stocked in community shelters. The title of the document is "Standard Supplies For The Fallout Shelter" and it has "ANNEX E" at the bottom of each page. 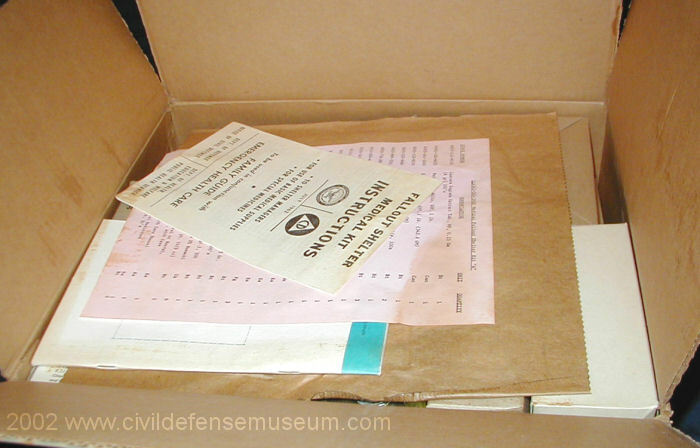 I thought it might be part of the Federal Civil Defense Guide but it doesn't have "FCDG" anywhere on it. The second sentence of the first paragraph of the document reads "The further development of packaging and material will cause this paper to be amended as development dictates." That reads like it's a preliminary document which was expected to be amended pretty quickly. 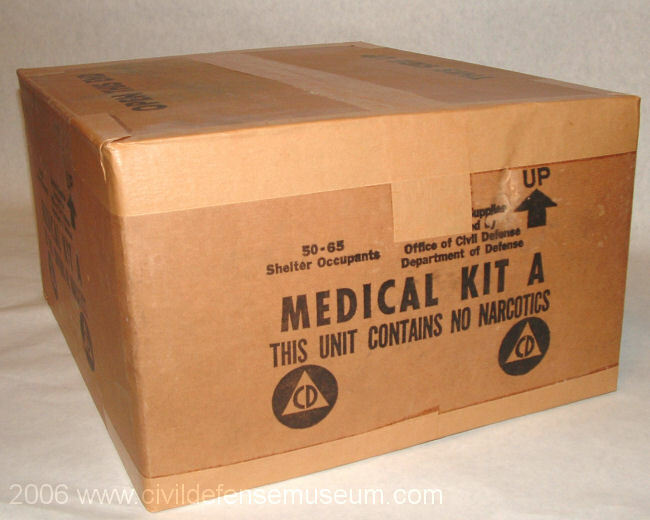 Anyway, I mention this document here because it lists a Medical Kit B. The Medical Kit B it lists was to be for 100 persons. It also lists an A Kit and a C Kit. 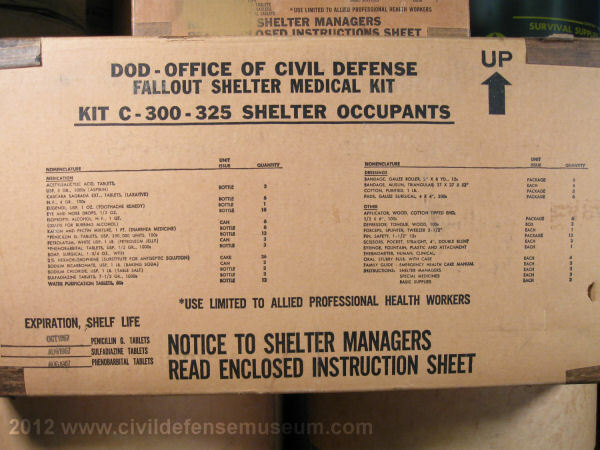 The reason I don't include the Medical Kit B in the contents list above is because the contents list for the medical kits in the document is a quite a bit different than what was to be the final version of the shelter medical kits seen on this page. 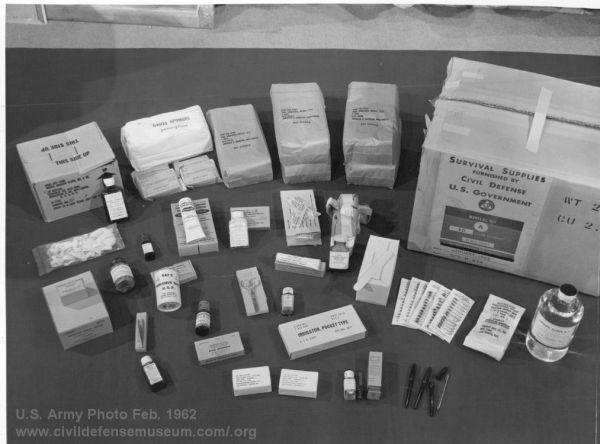 The January 1965 Federal Civil Defense Guide Part D, Chapter 2, Appendix 1 lists the medical kit contents as seen above and doesn't mention and "B" kit so I consider the Jan. 1965 FCGD Part D, Chapter 2, Appendix 1 the "final word" on the make-up of the fallout shelter medical kits.